We have completed testing of Norton Internet Security, Norton 360 & Comcast Norton Security Suite and have released an update. Customers running NIS, N360 20.4.0.40 or NSS 20.4 will receive an update to version 20.5. To download it, simply run LiveUpdate. This update is available in ENGLISH ONLY. See the below FAQ for details. A reboot will be required for Windows XP & Vista customers, however no reboot will be required for Windows 7 or Windows 8 customers. To verify you have the update, launch the Main User Interface, click on Support, and select About. The version number is 20.5.0.28. 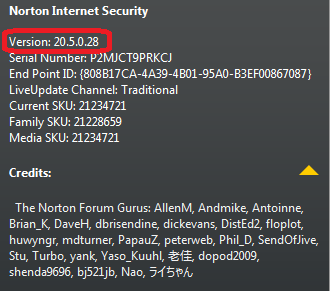 Please note that all Norton Internet Security, Norton 360 & Comcast Norton Security Suite customers running version 20.4 with a valid subscription will receive this update to version 20.5 for free. Not using the new Norton products? See if you qualify for a FREE update to the newest version of NIS, NAV, or N360 by visiting the Norton Update Center. 2. When will I receive the patch? This update is currently available via LiveUpdate in ENGLISH ONLY. More languages will be available shortly. 3. How can I manually install these patches? This patch is only available via LiveUpdate, which can be run manually. The primary changes in NIS/N360/NSS 20.5.0.28 are updates to Identity Safe, the Norton Toolbar, and compatibility of these components with the Google Chrome browser. As you may know, Google has changed their policy regarding toolbars, which now requires that customers obtain all toolbars from the Google Chrome Web store. This affects Norton Products, as the Norton Toolbar can no longer be installed locally, but must be obtained from the Google Chrome Web store as well. This update has been released to enable our customers running 20.4 versions of Norton Internet Security, Norton 360 & Comcast Norton Security Suite to use the Norton Identity Safe and Norton Toolbar features on the latest version of Google Chrome.